So I first fell in love with cooking while I was in Italy. It wasn’t the best place to start off my passion for food because no matter what, nothing I do now can live up to the amazingness that was created and eaten in Italy. 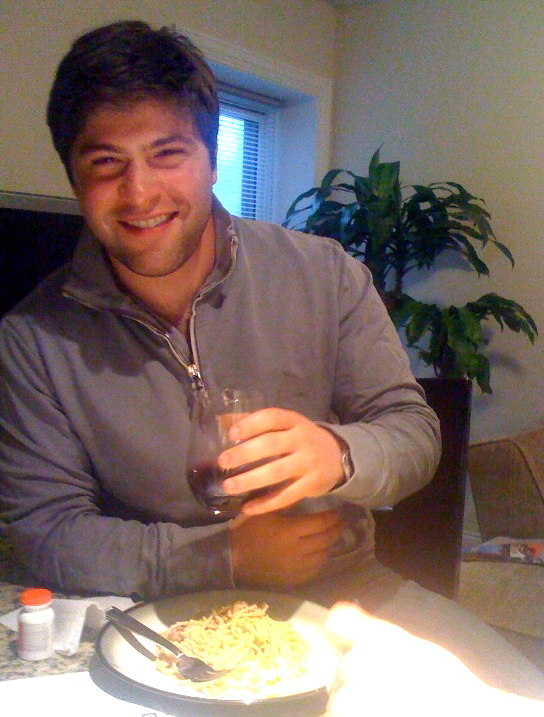 When my friend Jordan came to visit from Rome, we decided to have a BIG Italian feast. I decided to make Pasta Carbonara. To say it was good is an understatement. Later, when I came to Rome to visit Jordan, he bought a ton of pancetta, fresh from the butcher. Unfortunately, I messed up the Carbonara…I forgot to put the boiling water in the egg mixture and I am sure a few other things. Cooking while drinking a ton of wine (Chianti to be exact) in Italy does not necessarily help make a master chef. 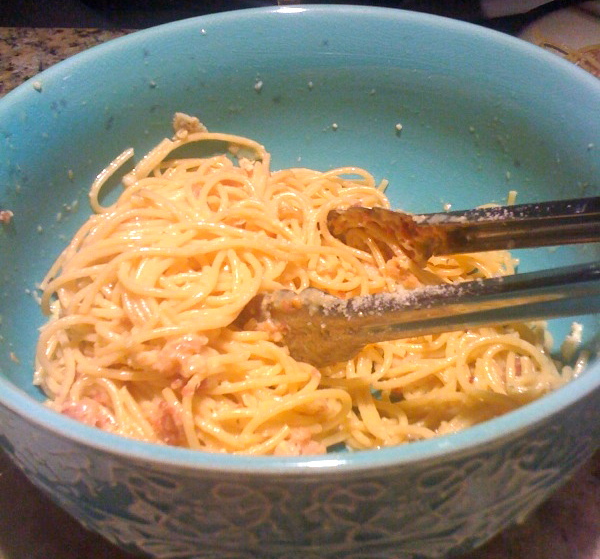 Good thing the pancetta was SO good and flavorful that the pasta was not completely destroyed. That is the thing with Italy. The food is so good on its own, it makes cooking fairly easy! Now that I do not have unbelievably fresh pancetta, fresh seasoning, and other delicious ingredients, it takes a little more effort and attention in the kitchen. 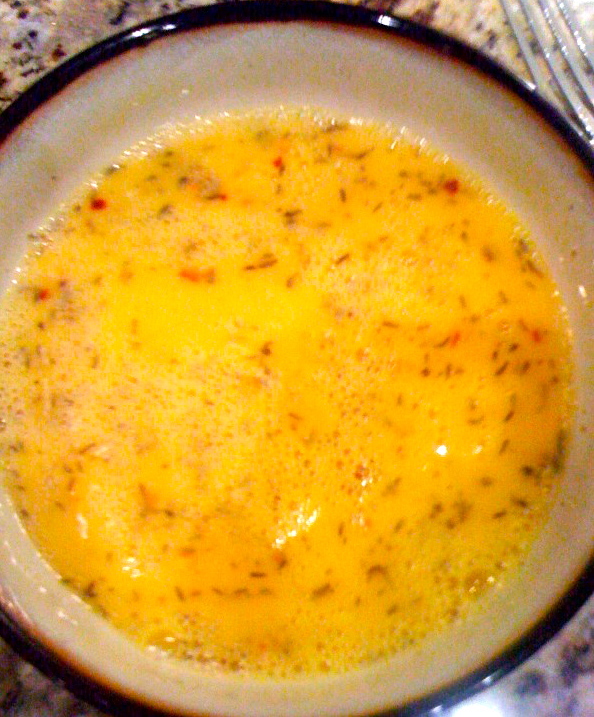 Mix eggs in a separate bowl. Add a little bit of salt and pepper, milk, red pepper, and parsley. Set aside. Start boiling your pasta water and cook pasta until desired. I recommend cooking it more al dente for carbonara. Save a ladleful of boiling pasta water to add to your egg mixture. Finely chop the pancetta. In a large skillet or wok, lightly saute garlic until translucent. 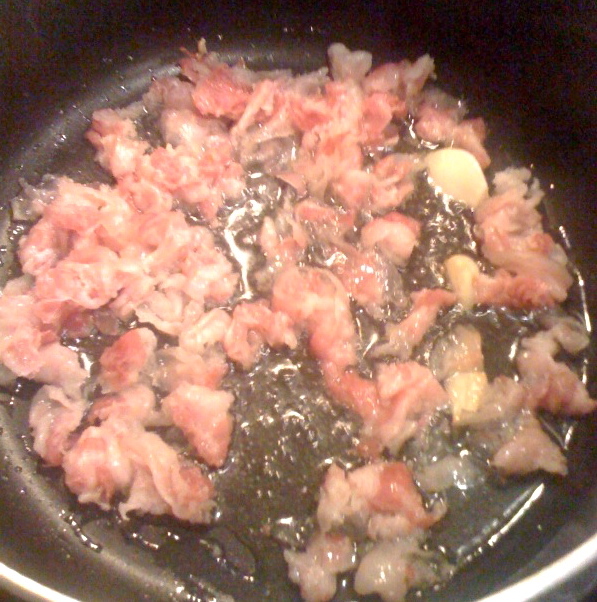 Add the pancetta and cook over medium heat. Cook a total of 4-5 minutes, or until brown. Drain the pasta and add directly to the skillet with the pancetta. Pour the egg mixture over the pasta and continuously mix the pasta until the egg mixture is fully mixed in. Add salt, pepper and cheese to taste. Offer extra cheese to guest and enjoy! Jordan enjoying my “American” Carbonara! 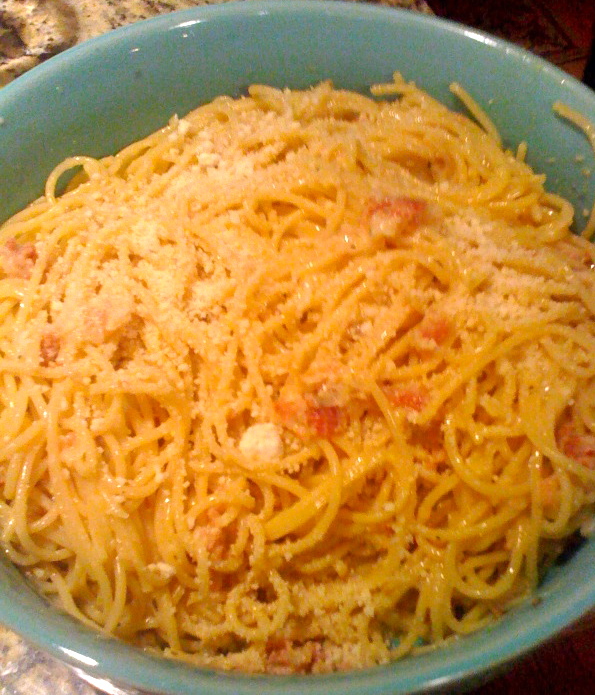 I had not made Pasta Carbonara in a few years, and will admit I was a little nervous! It’s not a difficult pasta to make, but I feel as if it is easy to make it under flavored or “eggy.” I was pleasantly surprised that it turned out perfectly flavored and very good, in spite of the pre-packaged pancetta, which had little flavor and was extremely thin. I was feeling a little under the weather all weekend, even though I had a surprise visitor (!! ), or else I would have made an adventure to the butcher on Halstead. I guess that will have to wait for another day…maybe when the weather stops acting up and just stays warm! My parents will be here on Saturday, but I am hoping to make pizza next Sunday!! Until then…healthy eating 🙂 Have a great week! I was also nervous when I saw the pre-packaged thin pancetta. I have to say though the meal was delicious and it shows that you are really starting to master the kitchen. Great job Lucia, your pasta Carbonara will always hold a place in my heart. 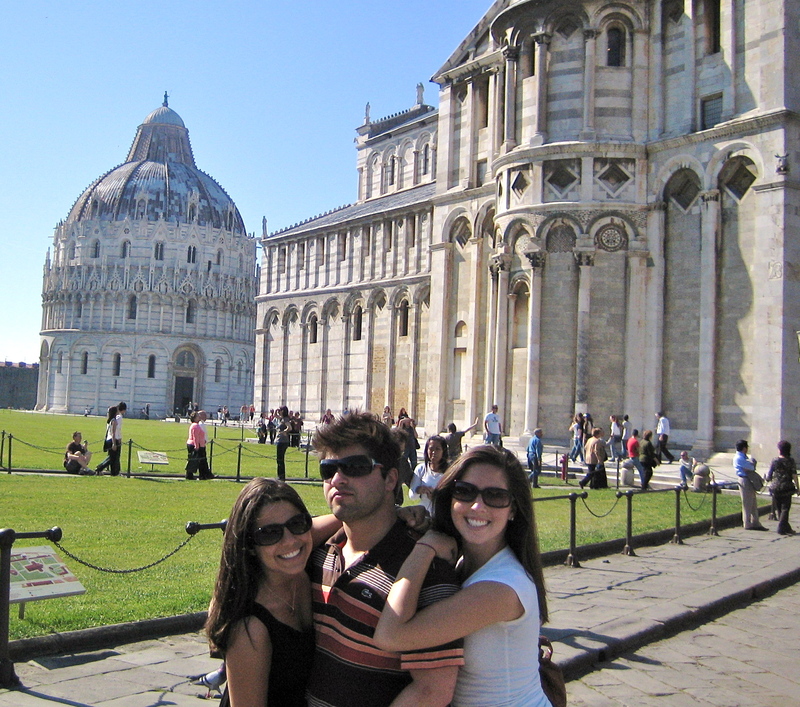 Wasn’t I in Pisa? No love.